Biofilm with breast implant: what should we think about it ? Breast augmentation and mastopexy - how to be safer? [Clinical analysis before surgery in facial and neck rejuvenation]. Five-year Safety Data for Eurosilicone's Round and Anatomical Silicone Gel Breast Implants. Reduction of skin closure time without loss of healing quality: a multicenter prospective study in 100 patients comparing the use of Insorb absorbable staples with absorbable thread for dermal suture. [Breast reconstruction with TRAM flap after selective embolization of the deep inferior epigastric artery (series of 69 patients)]. 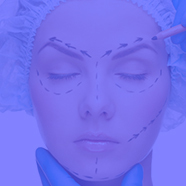 Skin closure with absorbable staples in aesthetic surgery. [Difficult necks. Diagnosis and treatment. Retrospective study of 145 cases using the method of Feldman]. Endoscopic transaxillary breast augmentation: clinical evaluation of a series of 306 patients over a 9-year period.